This week a has been one of chopping, storing, freezing, research and cooking. I don't cook. I don't usually like to cook but I can no longer be the Take Out Queen so I must begin cooking, again. Yes, again. Yes, Cizon CAN COOK. It's been a number of years since I was last found in the kitchen during the evening slaving, oops, loving, over the evening meal preparations. Looking back I would say 1997/1998/1999 may have been the last few years that I regularly cooked nightly. Like so many other dual working parent households we began grabbing take out or eating out nightly. Yes, nightly. I would say that out of seven nights a week we would eat/grab fast food or pizza out 4 - 6 depending on the week and what was happening in our home (or how exhausted I was that evening) and the other nights our resident cook, Chris, took care of meal preparations. 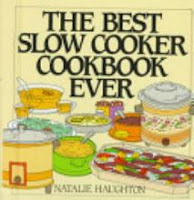 In 1997 I discovered a book that would enable me to throw everything into a pot and let it simmer and cook all day to make my life easier. It was revolutionary to my young mind and I was determined to purposefully begin preparing family meals much more easily. Well it goes without saying that the book collected dust for fourteen years and just recently resurfaced while we moved into our new home. The book, **The Best Slow Cooker Cookbook Ever by Natalie Haughton and published by Harper Collins Publishers, is easily broken down into eight distinctive chapters covering Appetizers and Snacks, Soups and Chowders, Chilis and Stews, Chicken and Turkey, Meaty Mainstays, Meatless Main Courses, Side Dishes and Condiments, and last but not least Desserts and Beverages. At the moment we are checking out Meatless Main Courses to satisfy a meatless budget and Gabi's vegetarian whims. Not everyone is hip on this new adventure. Chris continues to claim he can't live without meat and Andrew continues to become more picky. Chris eats and admits it wasn't too bad and Andrew finds other things to eat. I told Andrew today he may just have to get a job to begin buying/preparing his own meals if he isn't going to eat with us. I make him sit with us at the table to eat so tonight he pulled out the peanut butter and jelly....makes a mom proud! LOL - you know I always told my mom that I could live on peanut butter and coffee - maybe that is Andrew's motto too. Now that we are settling into the new home I am diving into the kitchen not necessarily out of necessity (yes as nine months of under/unemployment still loom in our home it is necessary) but also because I want to be there, Yes, Cizon wants to cook! I also want to bake and learn to decorate cakes and make sweets and pastries too. I HAVE RECLAIMED THE KITCHEN from Chris, kids, dog and cats (ok, I still have to fight Joe with his barking and run the cats out of the room- but I'm winning still). I unpacked and put away the kitchenware and plan to make it one of my favorite places to be in the coming days, years, decades. I am also working on a scrapping/card making area in my living room as well as a place to sew. Yes, I did say SEW. Really. REALLY! I was thinking the other day about how Home Economics should be required of all high school students in order to graduate from high school. I think I would have been a bit more prepared for life if it had been. Maybe if I had listened more to Mom and MeeMaw too as they attempted to teach me home economics first hand I would know my way around a kitchen a little better. Never a better time than the present time to get on with the show and learn how to be DOMESTIC! Hey I'm only 44! I plan to live to 121 the Lord willing so I am still young at heart and have a lifetime to learn! 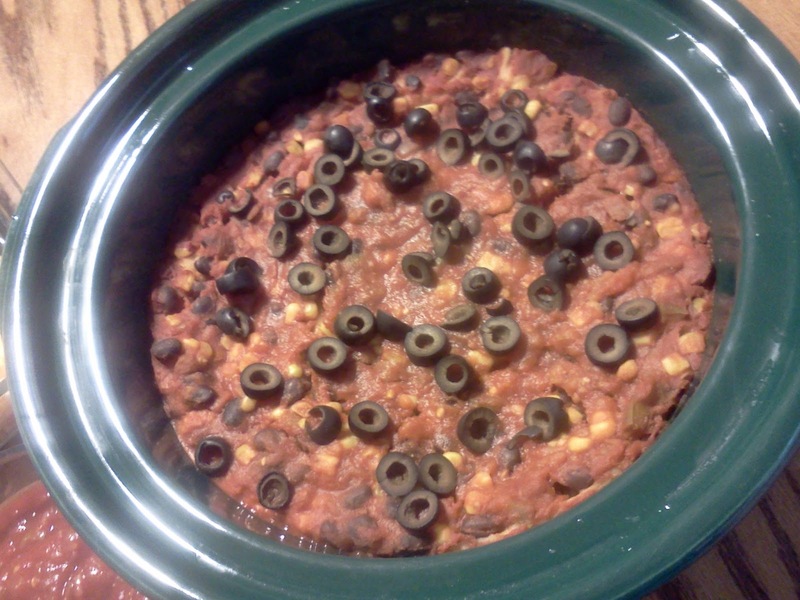 Tonight's crockpot sensation was entitled Vegetarian Enchilada Casserole. It was tasty but like Chris stated I think it needed some meat. It is made up of black beans, corn, salsa, green chili, spices and corn tortilla. I'll post the recipe so you can try it too if you want to check it out. 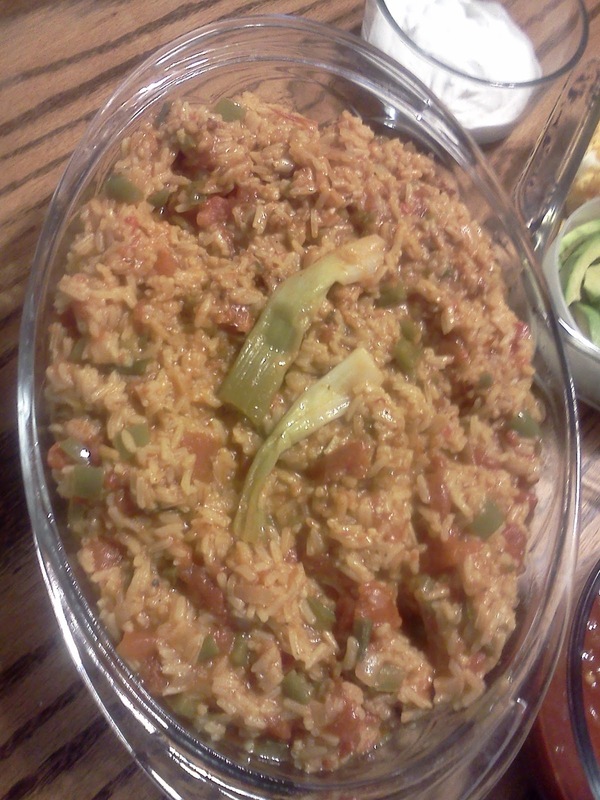 I googled mexican rice and came up with a recipe similar to one mom made when I was growing up and made that to go with dinner and it turned out pretty good too (recipe to be posted). 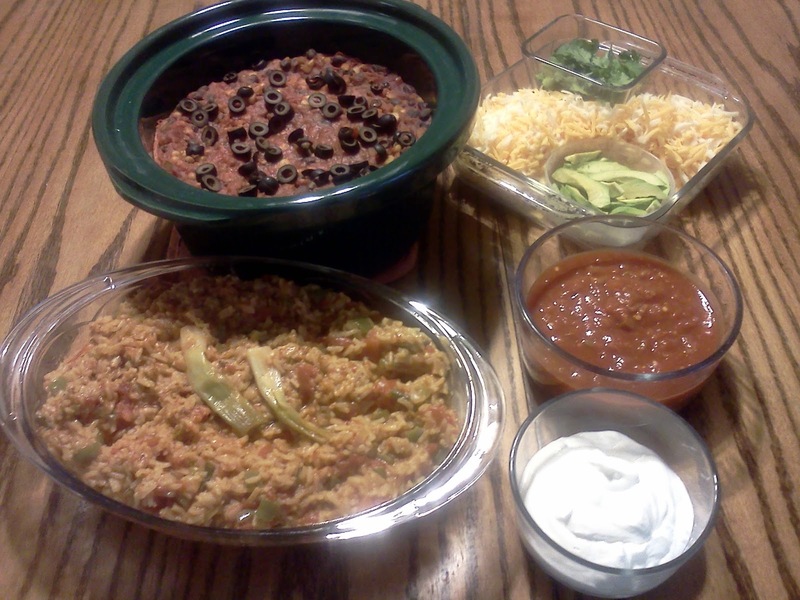 I do want to try CrockPot Enchilada's again but I will modify the recipe and will be using enchilada sauce in lieu of salsa as well as add chicken to it which should satisfy several palates in our home. We've enjoyed Ratatouille and Garden Fresh Tomato Sauce from the CrockPot this week. We were surprised at how well we enjoyed eggplant and zucchini in the ratatouille. Tomorrow will present Vegetable Paella to which I will be adding sausage. Dinner on a budget is working out this week. It only took me 12 hours to chop and prep and freeze give or take about 25 main daily meals this week. Now its just about pulling out the ingredients, firing up the CrockPot and searching for a side to go with dinner. I am also enjoying making bread each day in the bread maker. This weekend I plan to get my crafting area together and the twenty some odd years of pictures out and sorting began so I can finally scrapbook. I have a job interview at one of those local temp placement agencies on Tuesday so hope to get the house settled by then so I can pursue work by day and my love of being domestic by nights and weekend.